A really nice place to eat: good food, good people what more do you need? Good food, excellent service, very friendly, The first thing we received was paper and colors for our kids to paint. Very nice atmosphere, the food is good but quite pricey. Keeping this in mind it’s definitely a place to come back again. This was our second meal at this restaurant which we found very good overall the first time, a Monday evening. This time, Thursday, it was much busier, servers were slammed, food good except for the entrecôte main which was so grisly and tough, it was truly inedible. No replacement or apology. We would not return. 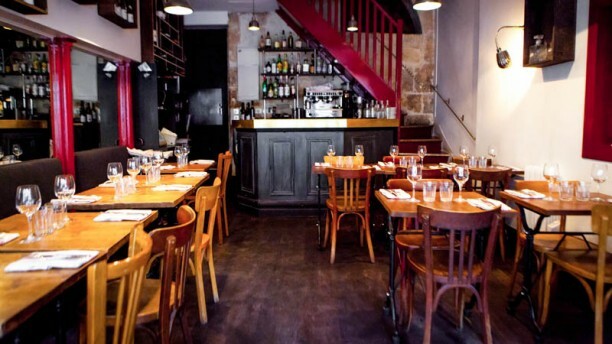 My husband and I had a very welcoming experience at Postiche our first night in Paris, a Monday when a lot of restaurants are closed. The food and wine were delicious and our servers charming and helpful. My husband had a tuna dish and I had a scrumptious mushroom risotto with truffle, mushrooms, and ham - all wonderful. Profiteroles for dessert were tasty. The appearance so the restaurant is basic and very French: we were the only tourists that evening. Fun. This meal was okay, but far from our favorite in Paris. The steak was more well done than we requested, but the salmon was very good. Good food and a very nice service! I would definitely recommend going here. Still great! Nothing has changed! Everyone was super, everything was perfect! STILL NOT TO BE MISSED!!! Amazing! We loved the place! The food was fantastic, the staff were all brilliant and friendly and efficient and kind. I can not recommend this place highly enough! Très bon restaurant, la carte au top et le personnel super agréable. Excellent food and friendly staff, the only problem is that there were no main dishes on the menu for vegetarians! My friend is vegetarian and they tried to offer her alternatives which was nice, but ultimately I was disappointed that they hadn't taken various dietary choices/needs into consideration. Aside from that everything was perfect. Everything was good! The service was warm and efficient. Food was great and price reasonable for the location. Recommended. Very average food, at quite high prices.